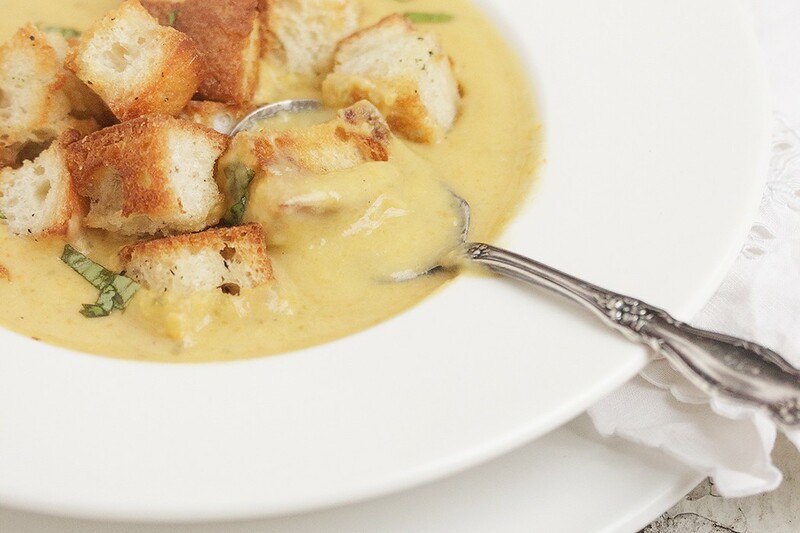 A delicious cream of vegetable soup, with croutons. Makes use of your left-over cooked or raw vegetables! I freeze a lot. Always in my freezer is a special freezer bag where small amounts of leftover vegetables go. When I have a bit left after a meal, I add it to the “For Soup” freezer bag. When the bag gets full, I make soup. My soup features corn, green beans, cauliflower, carrots and potatoes. It makes no matter what vegetables you start with. All you need is 3-4 cups worth (or a full medium-sized freezer bag). Don’t forget to add leftover mashed potatoes to the bag, too. They make a great addition to the soup and help to thicken it . If you’re someone who has regular bits of raw or frozen raw vegetables left-over (maybe the bit at the end of the bag that’s not enough for another meal), you can start another “For Soup” freezer bag with raw vegetables. They’ll work just as well in this soup, except that you’ll have to cook them until tender in the chicken stock for 15-20 minutes, before pureeing. A soup that makes used of your left-over frozen vegetables - either cooked, then frozen or raw, then frozen. In a large pot or Dutch oven, melt butter over medium heat. Add onion and cook, stirring, until softened. Add chicken broth and thyme. If using raw frozen vegetables, add them now. Bring to a boil, then reduce heat and simmer until vegetables are tender, 15-20 minutes. If using cooked frozen vegetables, bring stock to a boil, then add frozen vegetables. Reduce heat to medium-low and allow to cook a few minutes, until vegetables are warmed. 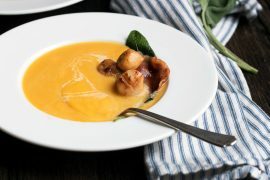 Using an immersion blender or in batches in a blender, puree soup until smooth. Return to pot and over medium heat, add the Half and Half/cornstarch mixture. Cook stirring, until mixture is warmed and slightly thickened. Taste and season with salt and pepper to taste. For croutons: Pre-heat oven to 400° F. Add diced bread to a large bowl. Drizzle with oil and sprinkle with salt, pepper and thyme. Toss well. Spread evenly on a baking sheet and cook in pre-heated oven for 8-10 minutes, stirring a few times, until golden. Allow to cool on baking sheet. Jennifer, greetings from the Prairies (north central Alberta). 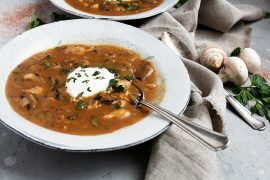 It’s the beginning of March, many of us have a dreadful cold/virus that has hung on for weeks…so, happily, I am going through your Soup Category! Such inspiring stuff, I feel better just reading the recipes. Your photos are divine, very accomplished and artful. Thanks for your dedication. I look forward to exploring your many other offerings. Now, if I can summon the energy, I’ll be off to make your Chicken Orzo Soup. Genius recipe!! Wonderful way to keep from wasting food! Beautiful photos too! I want to lick my ipad screen! I feel like whenever I have leftover vegetable odds and ends, I go for stir-fry, but this is such a nice change from that! Sounds tasty. And I am with you, I cannot tolerate wasting food. Ever! I completely agree I agonise over throwing away a shrivelled up piece of celery! This soup must be perfect for the cold weather you are being hit with. 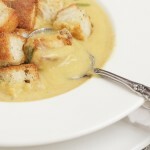 The soup looks delicious and such a great idea to use up leftover veg! 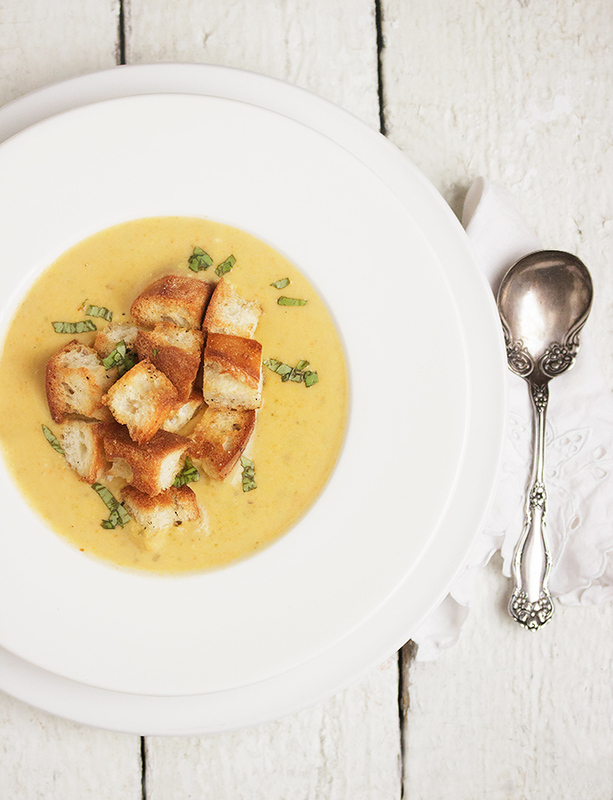 This is the perfect soup to repurpose leftovers and I love the crispy toppers! Great post! I haven’t thought about freezing leftover vegetables for soup. Genius! I need to take this to heart…I don’t want to be a food waster, but I’m afraid I’m guilty! Beautiful soup! I hate wasting food too, and this looks like the perfect way to use up vegetables! Lovely soup! Thanks Katrina. 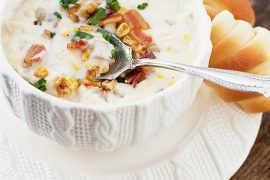 This is one of my favourite soups and I love how quick and easy it is! I’ve been using my freezer a ton. Great way to put my leftovers to work. And who can say no to crispy toppers? Thanks Heidi and I don’t know what I’d do if I couldn’t freeze my surplus :) The croutons are especially nice with this smooth soup, for a little crunch!